El Reg is reporting that O2 has been told by Apple not to release sales figures until Apple say so. UK carrier O2 has confirmed that Apple has placed it under a gagging order to prevent it from publicly revealing how many iPhone handsets it’s sold to date. The company’s head of media relations, Simon Lloyd, told Register Hardware that it’s a stipulation within the company’s sales agreement with Apple that O2 can’t release any such details until the Mac maker says so. Lloyd would only say that O2’s UK iPhone sales in the two weeks up to Christmas period were “in line” with its expectations. This is because the iPhone is completely bombing in the UK. Being in a University environment (where students always like tech gadgets), the only iPhone I have seen in the wild is an unlocked hacked-to-bits US model. The iPod Touch is undoubtedly a sound investment at just shy of £200 if you want a taste of “next gen” touchscreen interfaces and you are far better off buying an iPod Touch for the fancy new iPod bits and getting a free phone on a cheaper contract. You would have to be a complete mug (or rich fashionista) to buy an iPhone at £269 and be locked into an 18-month contract with O2 at £35 a month. If the iPhone actually did half the things standard UK mobiles have done for years, it would maybe be an acceptable high-end phone model, but its not. The US mobile industry is a couple of years behind ours (people import our Nokia N95s for instance) so the iPhone looks like a fantastic bit of kit in the US. 3G support. GSM/EDGE/GPRS do not exist there. MMS support for their mobile email with emoticons (絵文字, emoji). 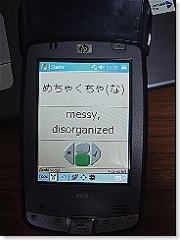 Without emoticons, users will get gibberish when recieving mails from “proper” mobile phones in Japan. QR barcodes. Apple should be pioneering these in the rest of the world already with their clout, but aren’t. The possibility is enormous here – in a music magazine, a QR code could be next to a new album review: the user scans it and can buy it from iTunes immediately over the air, no text input required. This happens in Japan already for all sorts of mobile content – Apple could be making this popular everywhere. 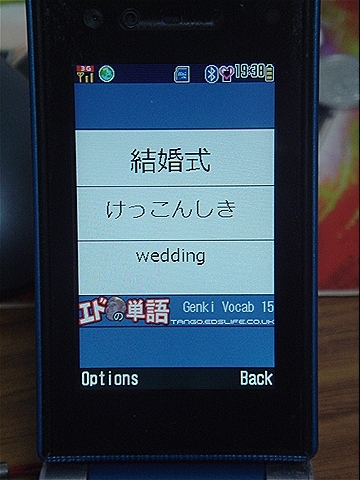 The Japanese text input is already programmed and is damn good on the iPod Touch, so that doesn’t need doing. Stuff like IC chips aren’t required, so its only those five points that I cannot see Apple surviving without. Windows Mobile phones released in Japan on Softbank now get an application for MMS with emoticons because the original models were seen as pretty basic without it. Only the Start button itself is visible. So far the only way to get the taskbar back I have found is to click the lonely Start button, click Windows Security, choose Start Task Manager, kill the explorer.exe process and start it again in the Task Manager from File > Run. Subsequent Remote Desktop connections are then fine, but logging back into the machine from the console then back into Remote Desktop makes it disappear again. A bit frustrating, to say the least. 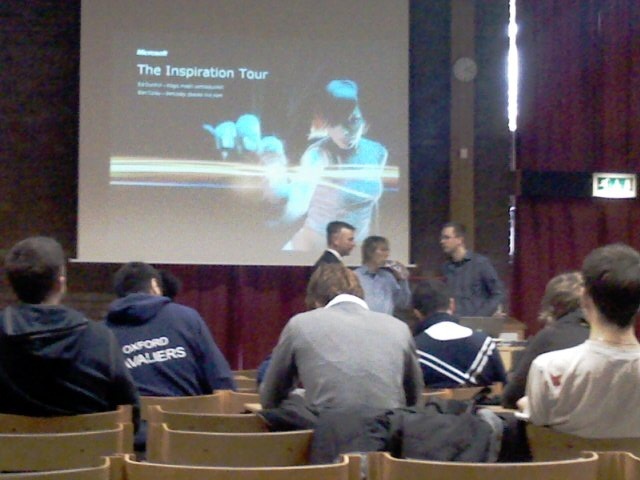 Oxford Brookes hosted one leg of the Microsoft Inspiration Tour today, where Ed Dunhill and Busted-lookalike Ben Coley sent out the marketing message to Brookes students about the latest MS tech: Silverlight, Popfly, Windows Embedded, XNA etc. I had to leave halfway to get to work, but it was very interesting. Unfortunately there was nothing new for people who already follow Microsoft news and tech such as myself, and the demos I had all seen before. This is the second time I have sat through the Fantastic Four Silver Surfer trailer on the Silverlight Fox movies demo site at a Microsoft event. Interestingly they had to bring a Xenon 360 devkit in for the XNA demos since they couldn’t definitely get an Xbox Live connection at the events they visit – which is required to run XNA stuff on a retail box. 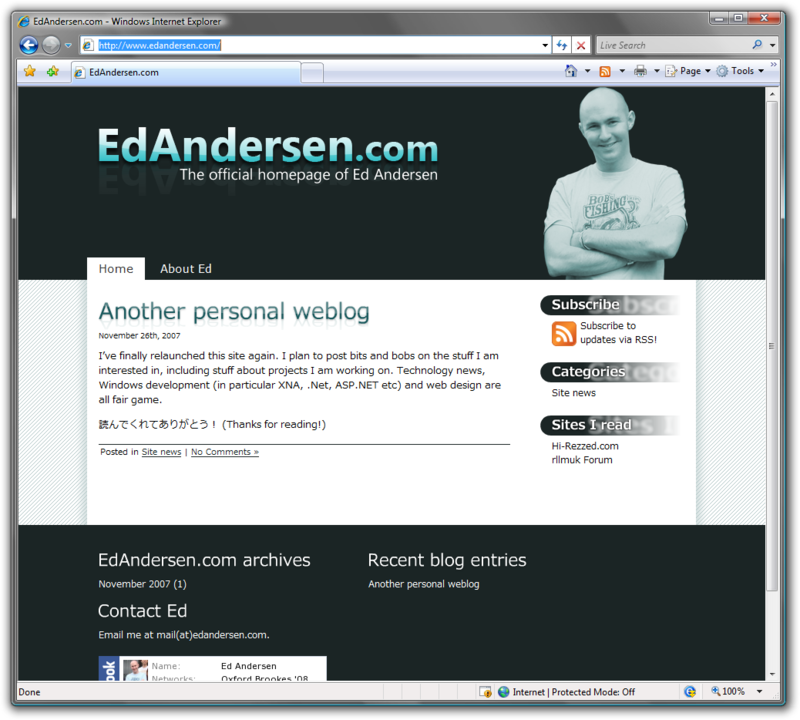 The presentation was a tiny bit out of date, for instance Silverlight 1.1 is now 2.0. Around 70 people had signed up for the event, but just about 30 turned up. This isn’t the fault of the marketing or the presentation itself (although Wheatley campus no doubt had something to do with it), but because simply Oxford Brookes is not a Microsoft shop. 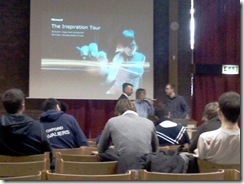 They mentioned that all the technology they were showing has one thing in common – the .NET Framework powers all of it. However, try finding a computer in the Brookes computer labs even capable of running a simple .NET Framework app (seemingly none of them have any version of the runtime installed). Furthermore, despite having excellent fully-functional versions of Visual Studio now available completely free as Express editons, these are not on lab computers and no C# or .NET content is taught on any Brookes courses that I know of. Introductory programming classes are still taught in Pascal using Delphi – leaving students scrabbling around to try and find a free version of Delphi 6 every year. Brookes isn’t allergic to .NET though (my final year project uses it extensively for ASP.NET and XNA) and will let you use it when a programming language isn’t specified. Maybe Microsoft should be giving an “Inspiration Tour” to the lecturers at the university instead, they could call it “Teach your students something relevant! Tour”. When the question “Who has heard of the .NET Framework?” was asked, 5 people put their hands up out of 30. These are meant to be computing students with an interest in technology – even my friend who is an Apple disciple knows about .NET. I toiled away for quite a while to create this WordPress theme which I think is pretty unique. I’m offering it up to the WordPress-using world. Just unzip into your themes directory. I still need to style the comment system and there are a few rough edges, but I thought I’d release it anyway. All you need to do it change the header image from my ugly mug and its pretty much your theme! UPDATE: No need to do this now, its fixed! Facebook and Yahoo, competing single sign on solutions, do not have this restriction, which the word “game” I assume is to block gambling sites from the authentication. To get around this, I have had to set up a dummy domain (edslife.co.uk) without the banned words and perform authentication on that – you cannot simply do a redirect because the signature returned by the Windows Live server will be invalid because its a different return URL. I then have to create my own authentication (I use a hash function based on the time and a secret word) to move between the dummy domain to the real one securely. Although this works, and is just as secure as authenticating on the target site I reckon, it provides a pretty shoddy user experience because I have to explain that there is another domain name involved. You also cannot use this method to get data from the Windows Live server such as contact information because from a different domain, the authentication is invalid. 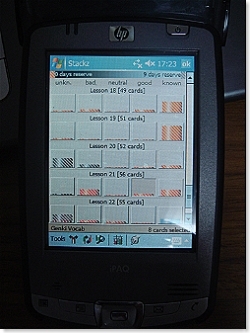 For Japanese language practice for my course I use PocketStackz by some chaps called “Minddate software”. 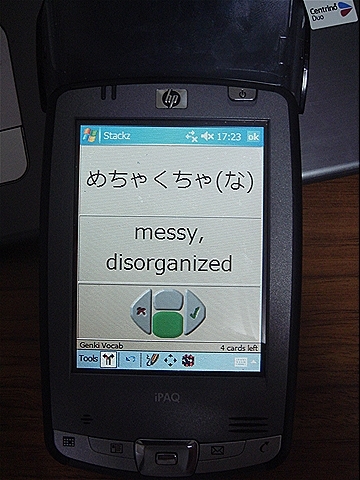 Its an all-purpose language flashcard program with an emphasis on Asian languages (such as that an Asian Unicode font needs to be installed on your PocketPC). What sets it apart is that you can immediately see what words you need to study at any point since the program sorts the words into “stacks” from “unknown” on the left to “known” on the right. If you get an answer wrong when testing yourself, the word moves towards the left, and visa versa if you get one right. This means when you have only a few hours until a vocab exam, you can quickly refresh the “most unknown” vocab in the quiz. Vocab or kanji can be tested in pretty much any combination (romaji to kana, kana to kanji etc) and I find I get better results if I use it for short periods of time often. My test results even confirm this – weeks where I’ve spent 5 minutes a day with PocketStackz have seen perfect vocabulary test scores. You still need a drive to study, when when you don’t need to get your textbooks and pen and paper out (or those silly little “word cards”) its easier to find the time. 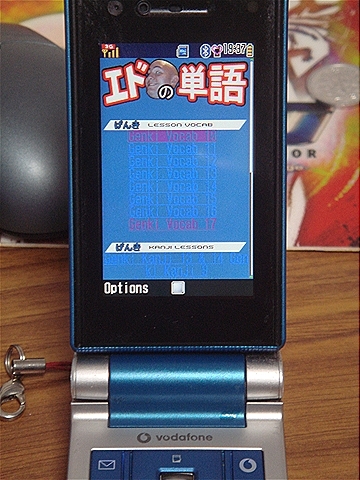 The software comes with a free PC application so you can make your own lists of vocabulary, but files for many textbooks and series of kanji (including the official joyo kanji) are available on the developers website. I had to make the kanji files for the Genki textbook series since they were not available, but this was painless using the PC software. Top stuff. 5/5. Plus its only 19$ from Handango and they have a free trial (which I liked so much I bought it). Thats £8! Update April 2012: Five years later after several server moves, this is no longer online – I’m still hunting for the files. Most likely it wouldn’t work on new keitai’s anyway. Edo no Tango (Ed’s Tango, エドの単語) is a Flash Lite based Japanese language vocabulary and kanji flashcard utility. Developed to help my study, it currently contains lessons 10 through 17 from the Genki series of Japanese language textbooks . It uses Flash Lite 1.1 so runs on the vast majority of Japanese contract phones (the pre-paid ones can’t quite manage it). Give it a try! Press the 1 key when in the flashcards to display the button commands. No Unicode support. This was the first major hurdle. Even on Japanese devices, it is impossible to display Japanese text using the device font. 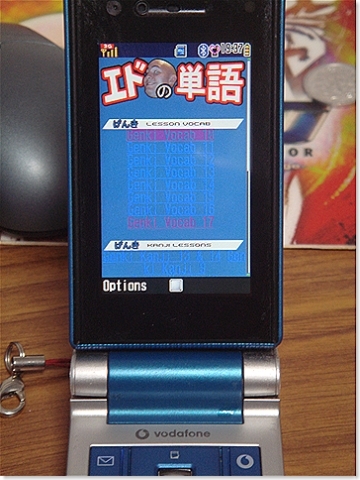 Flash Lite 2 fixes this, but in the mean time Japanese text needs to be encoded as vectors or images. 100kb network limit. It makes sense, but all the Japanese networks limit the size of any one file you download to around 99kb. This means with no Unicode, images or vectors for each kanji character soon add up. Dynamic network retrieval of data is limited to rudimentary text files with no XML support. No Unicode means retreiving data was impossible anyway, but this meant I had to create a seperate file for each set of flashcards, needlessly increasing data use and not making a very elegant solution. The phones have very limited memory, so my original idea of using 2bit images for each flashcard resulted in graphical corruption every time. Images would just turn red after showing four or five of them. In the end, 2bit images were converted into vectors using the “break apart” command. I don’t need to use this now (I bought an off the shelf Pocket PC application to do the job) so I haven’t got round to adding new lessons. Its not simply a case of putting new data on a server unlike a Flash Lite 2 based version would be capable of. 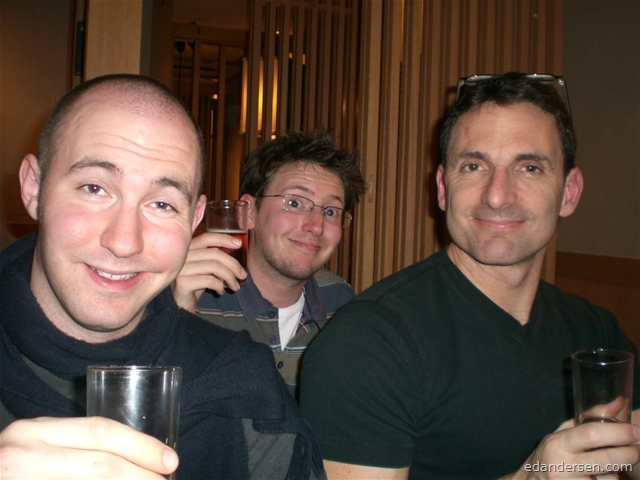 Inspired by one of my current professors Garr Reynolds, I’ve finally started a namesake blog. I plan to post once a week about something interesting, while building up a portfolio to show to anyone interested (have loads of projects I need to write about). The site is a bit rough around the edges at the moment, but that should hopefully change soon; I just really needed to knock it up quickly. I’ll be releasing the theme soon (since I pinched bits and pieces from other themes, most of which GPLd) including the source to my nice flash sIFR reflection modification used in the titles. 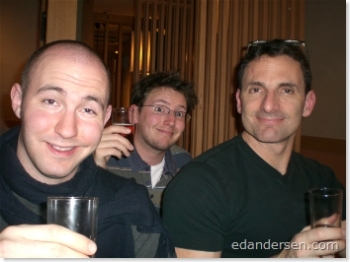 Just to start the blog off, heres a photo of me, Chris and Garr enjoying a beer.